Ask a teacher if they think HB5 is dumbing down Texas students. I have and yes the good ones know it is and will tell you so. 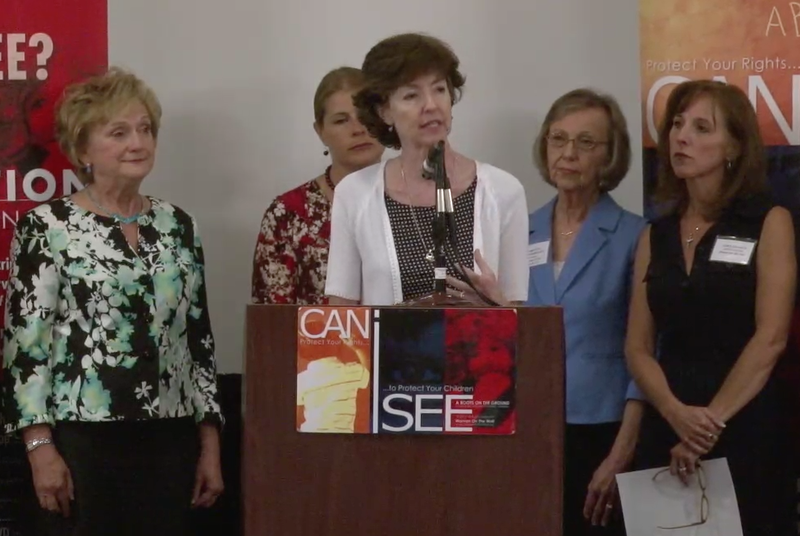 Take the time to watch Dr. Peg Luksik speak at the #CANiSEE the Solutions Conference in Austin. This is just a small portion from her amazing talk on the Federal Take over of education known today as Common Core/ College and Career Ready standards. Her full talk covers the true reality on the ground for children especially our minority students. HB5 which many of us have been saying is the Common Core philosophy of education. A public notice has been release you need to know about so that you can do your part to be there or make sure your friends and neighbors know the truth about HB5. Under HB 5 (passed by the last legislative session), Texas’ high school graduates will no longer be required to take both World History and World Geography. They also will not be required to take the capstone course in English which is English IV. Neither will all Texas graduates be required to take Algebra II and higher-level math and science courses. Not requiring these courses will send our Texas students out into the world bereft of basic foundational knowledge that will plague them the rest of their lives not to mention the fact that Texas public school graduates will go into college and/or careers with a shallow academic degree. I tried desperately before, after, and during the 83rd Legislative Session to get people to listen to my concerns about dropping the 4 x 4 graduation plan and gutting the individual student and teacher accountability at each grade level/course level. Now the Texas State Board of Education, the Texas Education Agency, and local school districts are stuck trying to implement HB 5 which mucks up every public school in Texas. The Committee will hear invited testimony followed by public testimony on the below interim charges. Examine STAAR writing scores for elementary, middle and high school students. 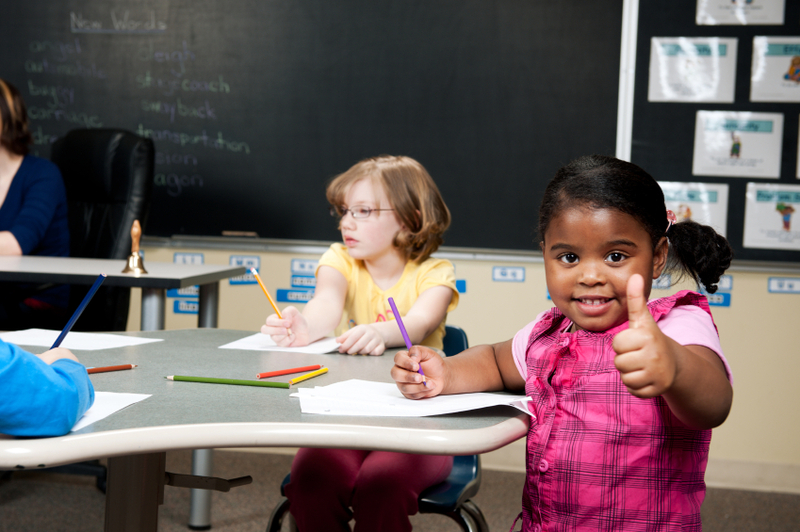 For grade levels tested in writing, review the types of writing required. Explore the need for targeted professional development in writing. · HB 617, relating to transition and employment services for public school students enrolled in special education programs. Public testimony will be limited to two (2) minutes per person. 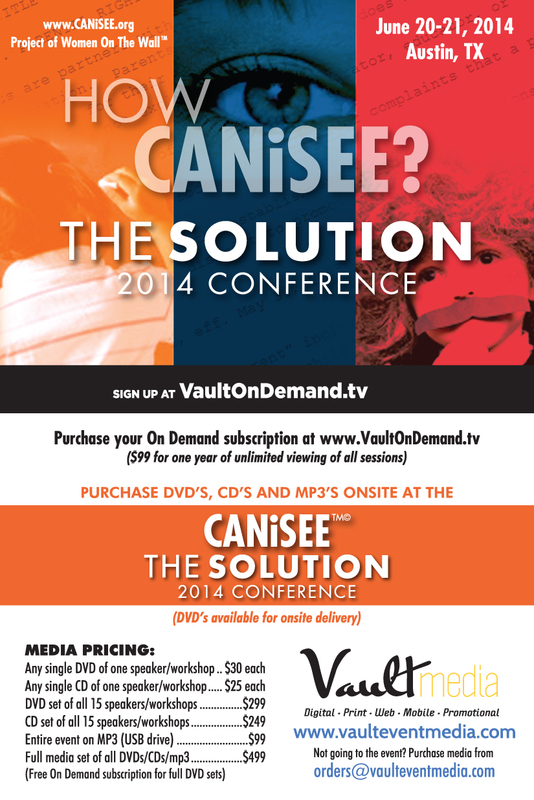 Join the Movement we need your support! Help WomenOnTheWall.org carry out our mission. We are the grandmothers, mothers, daughters, sisters of American women of all political persuasions, age and race and are the stewards of the home and hearth. We will stop at nothing to defend and protect our families. Your financial support is critical to ensuring that we can carry out our mission of protecting our nation for future generations and to fight for the safety and security of our children and grandchildren. Help us in our efforts by making a contribution of $25, $50, or $100 so we can keep fighting for our conservative values. Join Texans As We “STAND” for Our U. S. History and Our HEROES! are being called to ACTION! It is Time to Take a Stand! Please contact the Texas Attorney General Greg Abbott 512-463-2100 – Texas State Board of Education Members, State Legislators, Congressmen, elected officials, school administrators, teachers; and tell them that the AP U. S. History Framework/curriculum/exams must be stopped. How will the New AP US History Framework coming down from College Board President David Coleman affect TEXAS children this Sept.? “Americans are only just now waking up to a quiet but devastatingly effective effort to replace the teaching of traditional American history in our high schools with a new, centrally-controlled, and sharply left-leaning curriculum. The College Board, the company that issues the SAT and the various Advanced Placement (AP) exams, has created an elaborate new framework for the AP U.S. History Exam that will effectively force nearly all American high schools, public and private, to transform the way they teach U.S. History. Texas is at the forefront of the resistance to the new AP U.S. History Exam, but the battle is not going well. Ken Mercer, a member of the Texas School Board, is attempting to introduce a resolution rebuking and rejecting the new AP U.S. History Exam. Unfortunately, he is now being told that he must wait to introduce the resolution until September, when it will be too late. As Stated by SBOE Ken Mercer in his latest Op-ed. TEXAS SBOE Ken Mercer goes onto say…. In the period of the American Revolution up to the 1787 Constitutional Convention, almost every Founding Father is omitted – no Jefferson, Adams, Madison, or Franklin. The Framework excludes Lexington, Concord, Bunker Hill, Valley Forge, Saratoga, and Yorktown. The commanders and heroes of these pivotal battles are all omitted. The lessons on the Civil War omit the Lincoln-Douglas debates, the Gettysburg Address, and the assassination of President Lincoln. The Framework once again omits crucial battles, key commanders, and the valor of common soldiers. The lessons on the Civil Rights Movement do not mention America’s first African-American President. Dr. Martin Luther King, Jr., Cesar Chavez, Rosa Parks, the Navajo Code Talkers, Tuskegee Airmen, 442nd Infantry Regiment, and Barbara Jordan’s famous speech on the Constitution are all omitted. A word search of the entire 98-page document will not find one military commander or one Medal of Honor recipient. Our best and brightest students will thus learn nothing of the heroism and sacrifices of Americans in uniform. The CB instead presents an overwhelmingly negative viewpoint of U.S. history that will please America-haters such as former Illinois professor Bill Ayers. This unelected body is rewriting United States history and promoting among our students a disdain for American principles and a lack of knowledge of major American achievements. History is a dramatic story which, if taught well, allows students to study both the good and bad of America. The new APUSH Framework purposely stresses the negative while dismissing America’s positive contributions. If we do nothing, this radical AP U.S. History course will enter our high schools this fall. SO WHAT CAN TEXAS PARENTS, GRANDPARENTS AND TAX PAYERS DO? SHOW UP IN AUSTIN JULY 18TH AND SUPPORT THOSE WHO TESTIFY. "From the creators of Common Core, David Coleman and the College Board, the new AP US History course is an assault on our country’s heritage. The new AP US History (APUSH) framework presents a relentlessly negative view of American history, emphasizing every problem and failing of our ancestors while ignoring or minimizing their achievements. The College Board’s reinterpretation of US history, as presented in the new APUSH course, is a biased and inaccurate view of many important facets of American history, including the motivations and actions of 17th -19th-century settlers, American involvement in World War II, and the conduct of, and victory in, the Cold War." 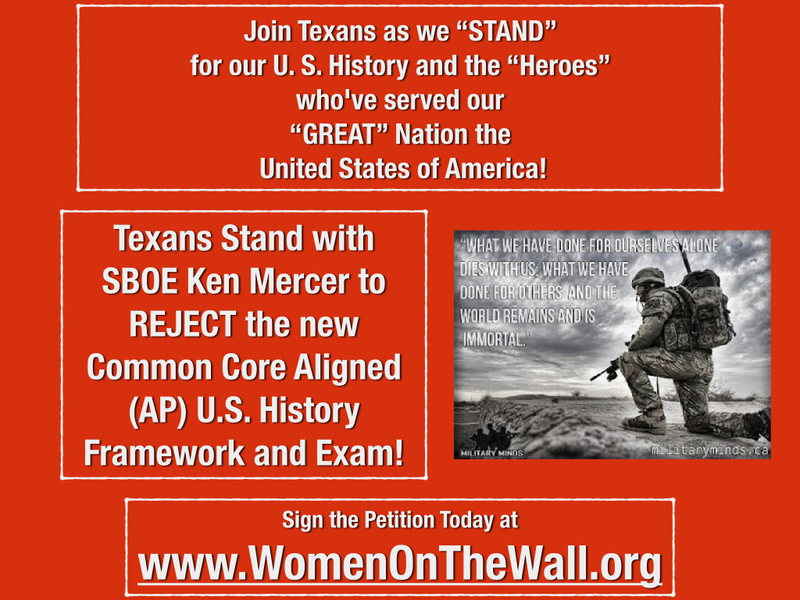 “Combat New AP U. S. History Course by Taking Action” http://womenonthewall.org/now-is-the-time-to-give-apush-fight-back-for-our-children Members of the public (e.g., moms, pops, grandparents, concerned citizens, AP U. S. History teachers) who object to the redesigned AP U. S. History course (APUSH) are needed to testify before the Texas State Board of Education either on Wednesday, Sept. 17, or on Friday, Sept. 19. #CANiSEE What Will Be Taught in AP U.S. History next school year?